Sometimes we let stress get the best of us. It may cause us to eat poorly, feel down and make excuses to not be active. Christine, 50, can attest to this and said that the last few years have been a journey to balance. Christine, who said she is heavier and weaker than when she was younger, had lost a lot of strength and mobility (she used to be a volleyball player). She acknowledges how stress negatively affects her well being, so to handle it better, she finds the time to take walks, practice yoga and train ForeverStrong. “ForeverStrong was the missing piece to help me feel more balanced. [I’m looking] for a lifestyle I can maintain long-term,” Christine said. Christine admitted that it’s definitely a slippery slope when she gets overworked or stressed. Her knee and leg issues certainly don’t help make things easier. Since training with us, Christine’s chiropractor of 13 years said her hip mobility and back have improved. Her overall strength has increased and she says ForeverStrong is a great complement to her bikram yoga practice (she’s more aware of how she engages her core and other muscles as she moves through poses). We have also been able to modify Christine’s program to accommodate her knee and leg issues without halting any progress. Don’t believe it? In just two months, Christine doubled the number of reps she could press overhead with 50 pounds. She also started off doing five step ups and lunges per leg and now she can do 15 of each on both legs. And let’s talk about her deadlifts… Christine hit a personal record of 18 deadlifts using 144 pounds — it’s definitely time to move Christine’s weights up! So what’s next? We’ll make those deadlifts heavier and we’ll give her more single leg work (adding weight to those lunges) to help rehabilitate her hips and knees. 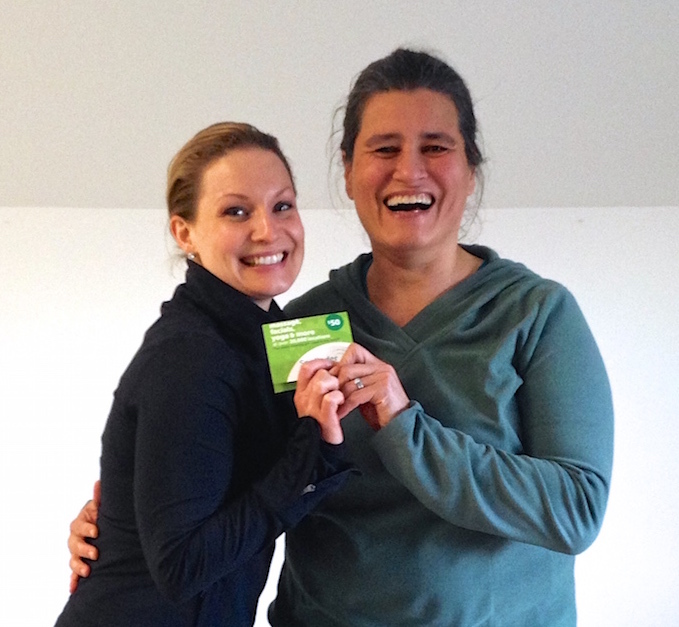 Kelly Scott rewards Christine with a $50 Spafinder giftcard. If Christine could go back in time, she would have told herself sooner the benefits of training ForeverStrong (the ability to regain strength and mobility, the efficient use of time and feeling better overall). If you’re busy like she is, “The gain for the time investment is huge,” Christine said. Congratulations, Christine! You are ForeverStrong. You are an excellent example of how to be a better balanced individual. You certainly inspire us by the fact that you put your well-being first! If you are looking for something to balance out the stress in your life, or if you haven’t discovered the missing piece to your fitness routine, you can let us help you by calling 301-452-5547 to schedule your complimentary fitness consultation.